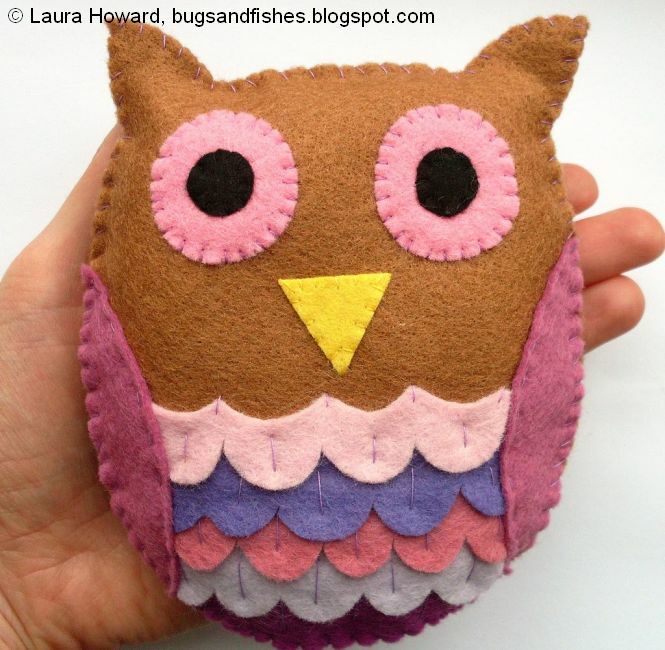 As promised, today I'm sharing a tutorial to make your own felt owl. - Assorted shades of felt in whatever colours you want. You'll need a larger amount of the main body colour and smaller pieces for the feathers and other details. You could make a "realistic" looking owl with lots of brown feathers, or use a selection of your favourite colours. 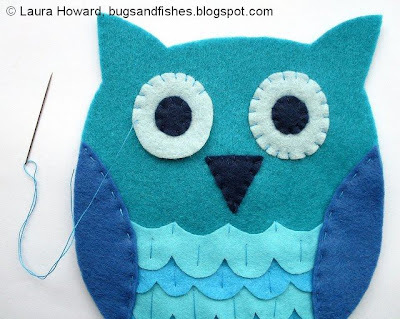 - Sewing thread to match the owl's pupils and beak. 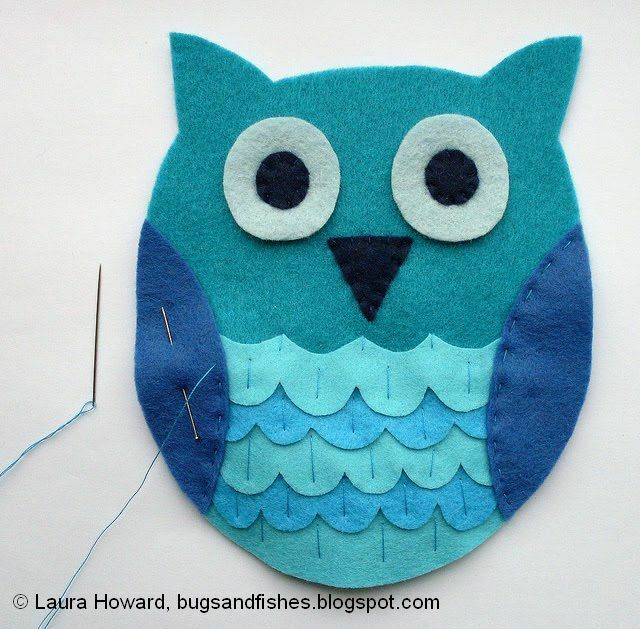 For sewing the rest of the owl you will either need one colour that you can use to sew all the pieces together or a selection of threads to match the felt you're using. 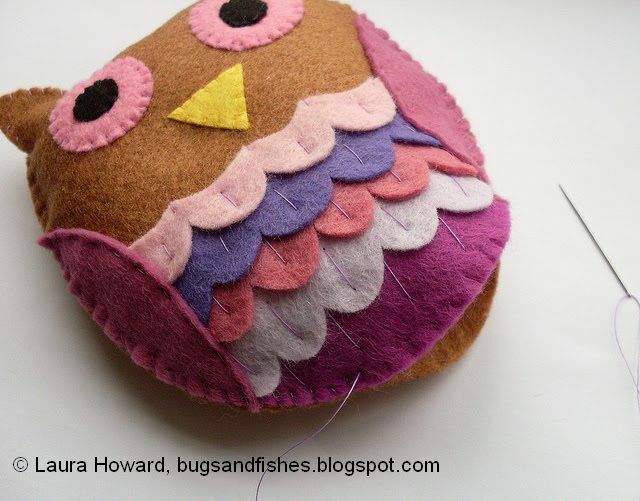 I quite like how the contrast between the thread and felt colours adds extra decorative details to the owl, but you may prefer to make your stitching as invisible as possible. 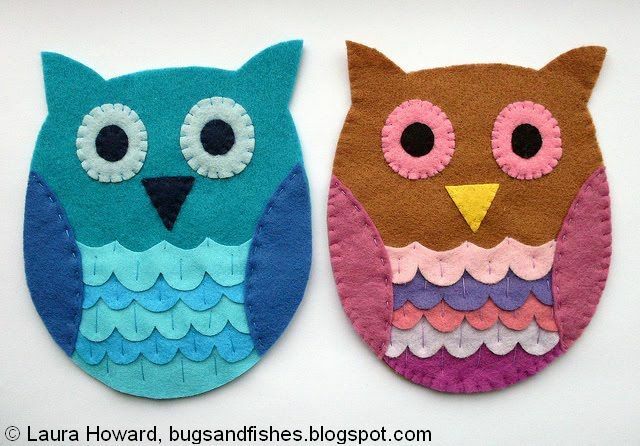 I chose lilac purple thread for the brown/pink owl pictured above, and turquoise for the blue owl shown below. - Sewing needle, scissors, pins, and a pencil. - The templates provided at the bottom of this post. 1) Cut out all the pieces using the templates provided and your choice of felt colours. You need to cut out 2 x body, 2 x eyes, 2 x pupils, 1 x beak, 1 x left wing, 1 x right wing, and one of each feather piece (#1-5). 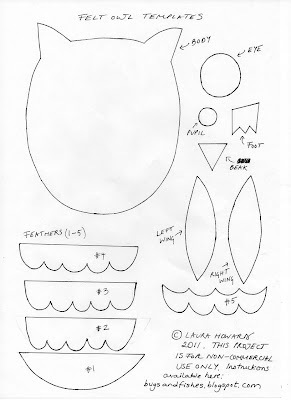 (The foot template also shown on the pattern sheet is not required for this project). 2) Position the eyes, pupils and beak on one of the body shapes (make sure you leave enough room beneath them for the feathers! 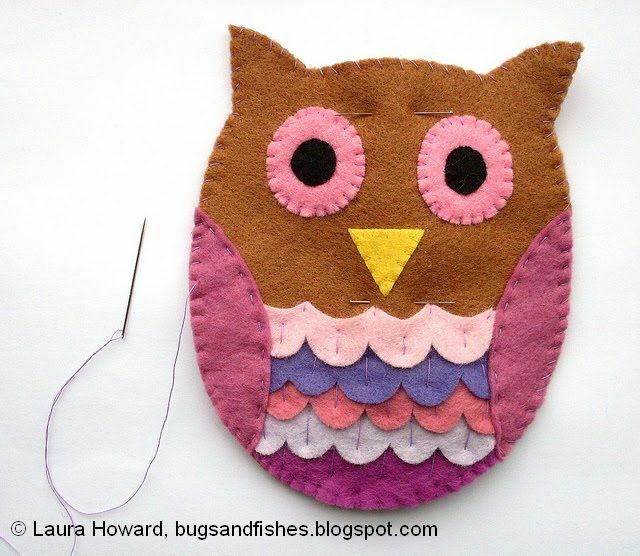 ), then use matching thread to whip stitch the pupils and beak in place. 3) Arrange the 5 feather pieces so they overlap as shown, starting with #1 at the bottom. Place the wing pieces in position over the top to check that the ends of the feather strips are hidden under the wings, then set the wings aside and pin the feathers in place. 4) Starting from the top of the feathers, stitch them in place with vertical stitches. 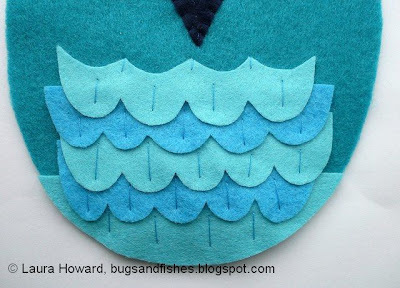 Use small vertical stitches along the very top row, then long stitches in the centre of each feather shape, and finish by sewing a final row of vertical stitches along the bottom feather piece. Remove the pins as you sew. 5) Pin the two wing pieces in position. Sew a line of running stitch along the inside edge of each wing then remove the pins. 6) Finish the owl's face by whip stitching around each eye. 7) Place the second body piece at the back of the one you've decorated, and pin them together. Sew around the edge with whip stitch, sewing the two layers together. Leave a gap along the bottom edge and remove the pins. 8) Stuff the owl with polyester stuffing, using a pencil to poke the stuffing into the top. Then sew up the gap with more whip stitches and finish your stitching neatly at the back. 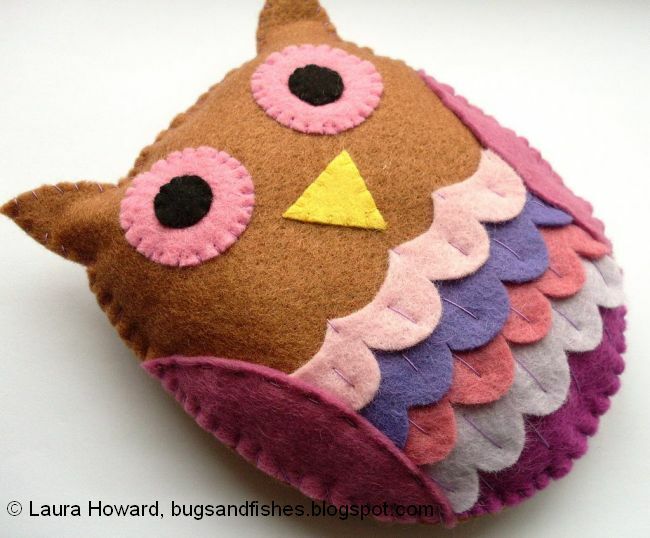 This cute little guy would look really sweet propped up against your books (wise owls love books!). Alternatively you could fill him with lavender instead of polyester stuffing to make a cute lavender sachet, or add a loop of ribbon before you sew his front and back together and display him on the wall or hanging from a door handle. Lovely owl! Thanks for the tutorial! 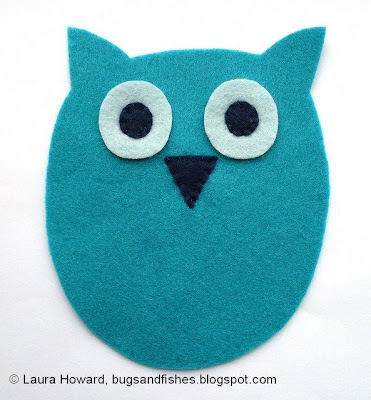 I might have to start rummaging through my felt supplies now to have a go! Very cute and I have been on a felt animal kick! I have a question though what kind of sicsors do you use to cut out the little pieces and details. I can't seem to get mine cut very well, I'm using sharp fabric shears. Such cute Owl! Thanks for the tutorial! I'll be making a few! I have been following your blog for a while now but haven't commented before. Thank you for the owl tutorial. I have added your book to my Amazon wishlist! Thanks for a great tutorial - I'm going to take a little kit of felt away on holiday as a rainy day project for my daughter! 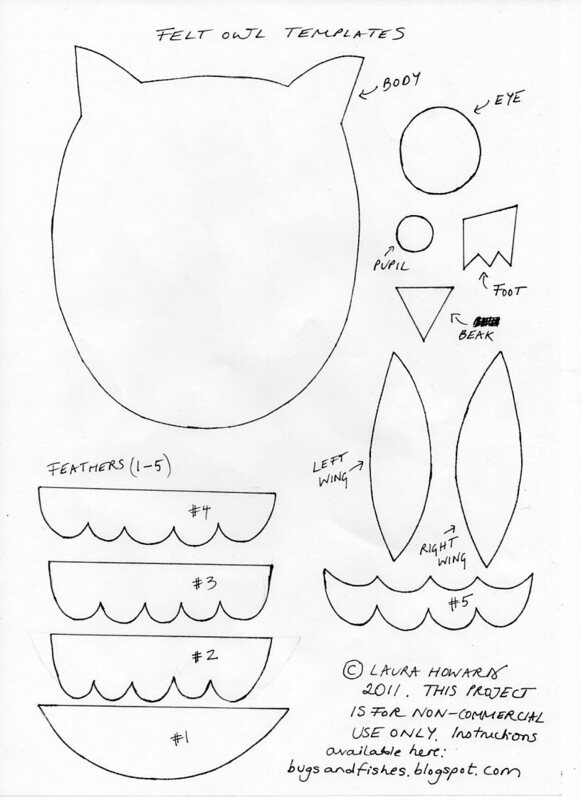 Can I just check that I'm printing the pattern at the right size - the body piece is 7cm tall - is that correct? 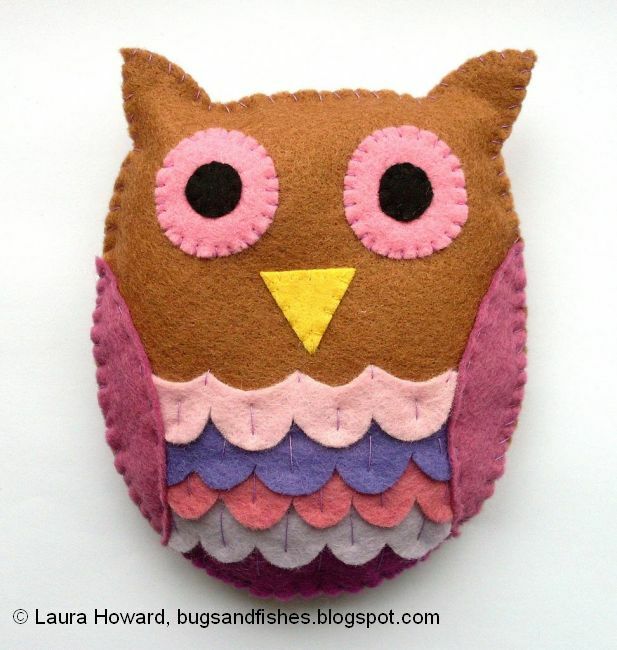 Harrysmum - excluding the ears, the owl body piece is 13cms high. You may need to click again on the template image to make it full size on your screen, then set it to print at 100%. Awww, what a cutie! I'm planning to do something with felt soon, found a whole lot in a box just now. Thanks for the tutorial, supercute! 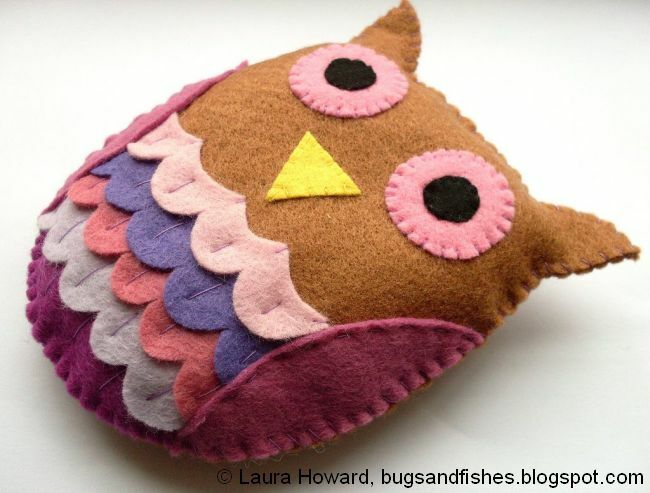 Coincidentally I've made a a little felt owl this week, which I have posted this morning. Hope you can pop by and take a look: http://jumbleberries.blogspot.com/, would love to hear what you think. I love this owl, especially the blue one. Oh my goodness, this is absolutely adorable! Thanks so much for the tutorial - I can't wait to try it! Very cute!!! Thanks for the tutorial! Thank you so much for the tutorial. Can't wait to make one of these cuties. I tried my hand at it - www.somenotesfromafar.blogspot.com - and linked back to you! Now I want to make more! Thanks for all the comments everyone - it's awesome to see my little owl get so much love! I'm going to make it as a decoration on a pillow, a convocation gift for my best friend. She will love it!!! Loving it i am sorry but i am only starting to learn sewing so i thought that this was an easy project to do but how you sew the front and back part because i can't do the whip stitch? Very nice !! Thanks for the tutorial! EXACTLY what I have been looking for! I am making a mobile for the baby we are expecting in Feb and these little guys are perfect! Thanks so much for sharing! Thank you for such a lovely tutorial. It inspired to me to buy some felt from you just before Christmas and I have made the sweetest little fellow. There is a picture of him on my blog. I think I need to make him a few friends now. I just love these. I am new to this kind of craft. Is there a special type of felt to use or a way of prepping it so that they don't get fuzzy and worn looking,especially on the edges? Anon - you could perhaps try 100% wool felt which is thicker/sturdier than wool blends, or a top quality acrylic felt perhaps... but most felt will fuzz a bit with use and along the edges when it's cut. A lovely design! 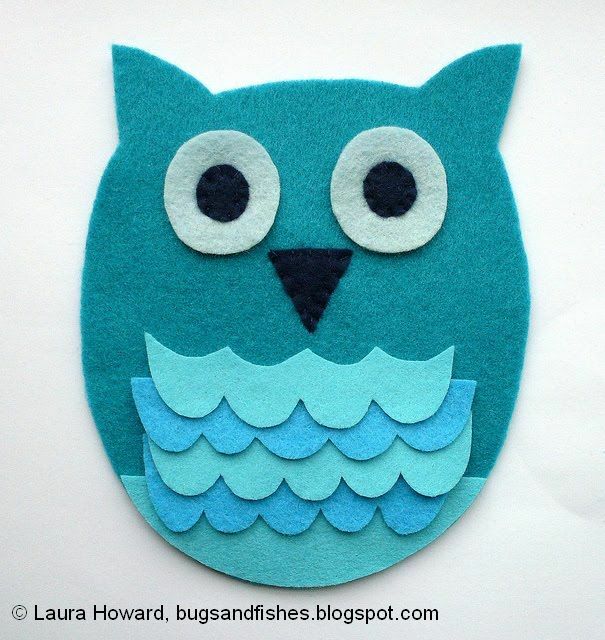 I used your owl as inspiration for a picture that I made for a Pinterest challenge, here he is http://jenniferslittleworld.blogspot.com/2012/03/pinaddicts-pinterest-challenge-felt-owl.html hope you like it! So cute! Owl is my favourite now! It's good and very proffessional work! Hi, i love this owl, but i can't find where you've put the feet on it? Oi, adorei o blog e o tutorial, obrigada! Think I'd love that on a jumper! Would it work? Never tried crafting with felt. Should definitely try! I fell in love with felt crafting... And ur tutorial and templates are amazing... Loved ur work! You're owls are really adorable and I can wait to get started! I have a question though: How do you attach the feathers exactly? I haven't tried vertical stitches before and part 4 confuses me a little. Could you perhaps explain it to me in a little more detail? Hi Ellen, sorry for the confusion - when I talk about vertical stitches I just mean single stitches sewn so they form vertical lines on the owl. Just arrange the feather pieces as you'd like them and sew a series of single stitches to hold all the pieces in place. Super-Cute Felt: now in stock!